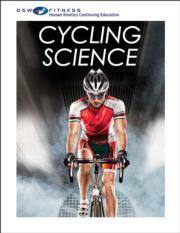 This continuing education course with text, study guide, and exam offers comprehensive and cutting-edge coverage to develop stronger cyclists. Topics include the rider–machine interface, environmental stressors, health issues, the planning of training programs, and racing techniques. Describe the ideal body type for specific cycling disciplines. Compare and contrast common categories of road bikes based on use and geometry. Analyze the rider–bike system, paying special attention to the saddle’s central role as the main weight-bearing structure. Discuss the effects of changes in bike configuration on cycling performance and injury risk. Explain the fundamentals of aerodynamics that are relevant to bicycles and their riders. Recognize the environmental stressors that affect cyclists and identify ways to minimize the negative effects. Identify the muscles that contribute to pedaling power. Summarize the factors that determine a cyclist’s climbing performance. Discuss the most recent findings in the roles and timing of nutrition and hydration for maintaining performance throughout a long ride or over a prolonged period of training for a race. Identify the most common cycling injuries and recognize the symptoms of overtraining. Describe the effects attributed to a warm-up protocol and the implementation of stretching. Analyze the various cycling disciplines—road racing, mountain biking, track, BMX, and ultradistance cycling—in terms of competition demands and training needs.